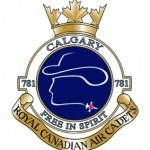 Royal Canadian Air Cadets 781 Squadron (781 “Calgary” Squadron – 781 RCACS) is based and was founded in the heart of northwest Calgary and has a membership of more than 200 cadets. Regular parades (meetings) are held Wednesday evenings from 6:30 to 9:30pm with extra activities happening on Monday nights, Saturdays and Sundays may also be used from time to time for special or additional extra curricular activities. Whether or not you have heard about Air Cadets, here is your chance to learn what it means to me personally and why you should try it out for yourself. The benefits that can be gained from belonging to this youth program are unlimited and incredible, to say the least. Opportunities arise constantly; it is just up to you to grasp them and use them to your own advantage. There are many activities to participate in, awards to earn, challenges to be met, and friends to be made. Most of all, Air Cadets will deliver you to a whole world of learning and challenges. You will develop useful, lifelong skills that can be taken with you to school, work and any place else. There are several weekly activities available through this program in addition to the parade nights. Drill team, flag party, biathlon, military band, pipes & drums band, and ground school are some examples of what Air Cadets has to offer. Air Cadets also proudly wear a blue uniform that shows professionalism, not to mention badges and ranks. It is very important to remember that the Air Cadet program is completely cost-free, including the extra activities and camps! There are also summer camps and various weekend activities including gliding, camping and service functions. At campouts, the cadets learn survival and have a lot of fun in the wilderness. The summer camps are anywhere from two to seven weeks long and you will even be paid a training bonus of $60.00 per week to go! At the camp, you will make friends from across Canada and incredible memories. There are basic training camps for beginners and introductory courses for junior cadets. Lastly, there are advanced specialty courses/scholarships available for senior cadets who earn the privilege to attend such courses. Cadets can receive their glider and/or pilot’s licenses over the summer, or even travel outside the country through international exchanges. Cadets also have the option of staffing at any one of these camps. Most of my best memories are from being involved in Air Cadets. I joined cadets when I was in grade nine. I am now in grade 12, level five, and hold the rank of Flight Sergeant at 781 Calgary squadron. Thursday nights I enjoy instructing other cadets from levels one to four and I help run weekend exercises. I have had the privilege to go flying in a Griffon helicopter and go gliding. I have gone on the Introduction to Aviation Course in Manitoba, Survival Instructor Course in Quebec, and the Senior Leadership Course in Cold Lake. I have earned certificates in First Aid and been awarded Top Junior Bandsman and Top Level 4 Cadet awards. I even won the award for having the shiniest boots in my second year of cadets! I attended the Raider Atlantis Leadership Seminar and several band weekends. This year I am involved in the biathlon and drill teams and am applying for the International Air Cadet Exchange scholarship. These are only a few of the numerous experiences I have had in my years in Air Cadets, and have many more to come. It is difficult to imagine what I would be like without these experiences because they have impacted my life in such a phenomenal way. The hundreds of teens enrolled in this program have skills and knowledge that will give them advantages throughout their lives. Air Cadets has given me the determination to accomplish high-set goals, a chance to help others learn, and the experience of a lifetime. We, the Air Cadets, encourage you to take on the challenge of joining the Air Cadet team so that you too will experience a fun, beneficial, unforgettable adventure that you will never regret. We dare you!